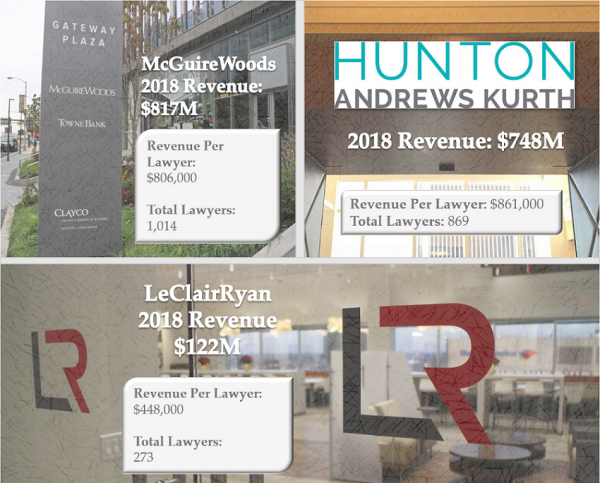 The financial performance of some of the biggest names in the Richmond legal industry earned attention in recent weeks from a popular trade publication, which found that three of the region’s largest law firms brought in a combined $1.6 billion in revenue last year. American Lawyer began releasing initial details from its forthcoming AmLaw 100/200 list of the nation’s largest law firms. That included the publication’s initial reporting on prominent downtown Richmond firms Hunton Andrews Kurth, McGuireWoods and LeClairRyan. 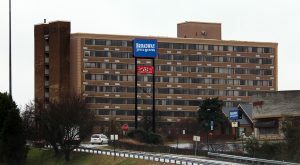 McGuireWoods, which is based in the Gateway Plaza building downtown, was atop the trio in revenue, bringing in a gross annual figure of $817 million in 2018, up more than $100 million, according to the report. The firm’s revenue per lawyer was $806,000, up from $707,000 in 2017. Profits per equity partner were $1.36 million, compared with $1.02 million in the previous year. The firm reported 1,014 lawyers firmwide, down by four from the prior year. That includes 180 equity partners, up 14 from 2017. 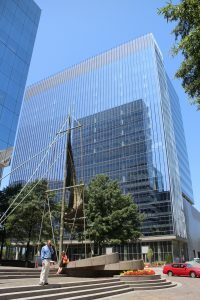 At Hunton Andrews Kurth, formerly Hunton & Williams, revenue for the year was $748 million, according to the initial AmLaw findings. The firm, which is based in Riverfront Plaza, ended its fiscal year March 31. Its revenue per lawyer in 2018 was $861,000. Profits per equity partner was $1.09 million. The firm reported 869 total attorneys, of which 180 were equity partners. 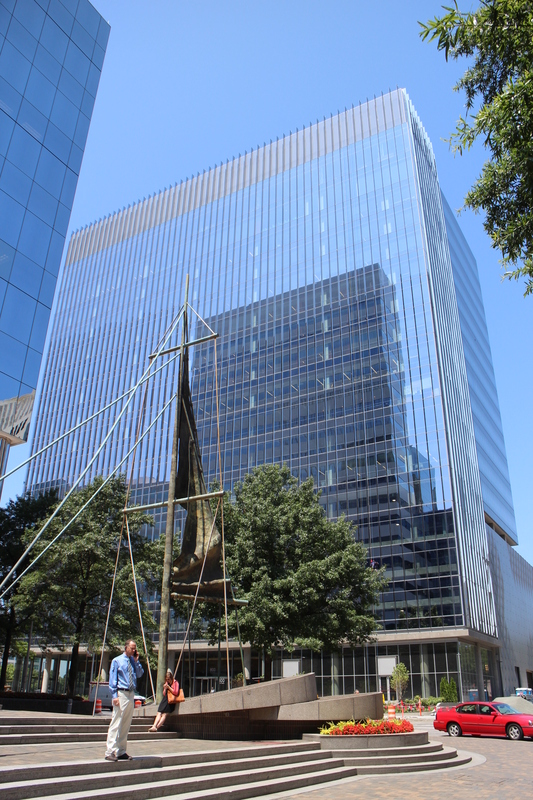 At LeClairRyan, which keeps its Richmond office in the SunTrust Center downtown, gross revenue in 2018 fell to $122 million, down about $20 million from the previous year. AmLaw reports that as the fourth straight year of revenue declines. 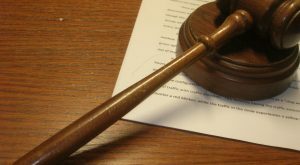 Revenue per lawyer was $448,000, down about 5 percent. AmLaw notes that LeClairRyan did not report profits per equity partner for 2018. 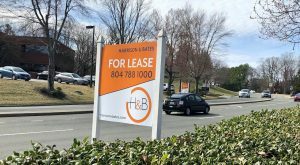 The decrease comes as the firm continues to deal with lawyers departing for competing firms, including from its Richmond ranks. The firm’s headcount at the end of 2018 was 273, according to the report, down from 302 in 2017. 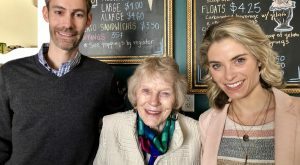 However the firm told BizSense in early February that it had 239 attorneys in total, 68 of which are “members” or the firm’s equivalent to shareholding partners. The full AmLaw rankings are set to be released this month.